is assistant professor in history and philosophy of science at the City College of New York. She is the author, together with Guido Bacciagaluppi, of the book The ‘Einstein Paradox’: Debates on Nonlocality and Incompleteness in 1935 (forthcoming). In the summer of 1935, the physicists Albert Einstein and Erwin Schrödinger engaged in a rich, multifaceted and sometimes fretful correspondence about the implications of the new theory of quantum mechanics. The focus of their worry was what Schrödinger later dubbed entanglement: the inability to describe two quantum systems or particles independently, after they have interacted. Until his death, Einstein remained convinced that entanglement showed how quantum mechanics was incomplete. Schrödinger thought that entanglement was the defining feature of the new physics, but this didn’t mean that he accepted it lightly. ‘I know of course how the hocus pocus works mathematically,’ he wrote to Einstein on 13 July 1935. ‘But I do not like such a theory.’ Schrödinger’s famous cat, suspended between life and death, first appeared in these letters, a byproduct of the struggle to articulate what bothered the pair. The problem is that entanglement violates how the world ought to work. Information can’t travel faster than the speed of light, for one. But in a 1935 paper, Einstein and his co-authors showed how entanglement leads to what’s now called quantum nonlocality, the eerie link that appears to exist between entangled particles. If two quantum systems meet and then separate, even across a distance of thousands of lightyears, it becomes impossible to measure the features of one system (such as its position, momentum and polarity) without instantly steering the other into a corresponding state. Up to today, most experiments have tested entanglement over spatial gaps. The assumption is that the ‘nonlocal’ part of quantum nonlocality refers to the entanglement of properties across space. But what if entanglement also occurs across time? Is there such a thing as temporal nonlocality? The answer, as it turns out, is yes. Just when you thought quantum mechanics couldn’t get any weirder, a team of physicists at the Hebrew University of Jerusalem reported in 2013 that they had successfully entangled photons that never coexisted. 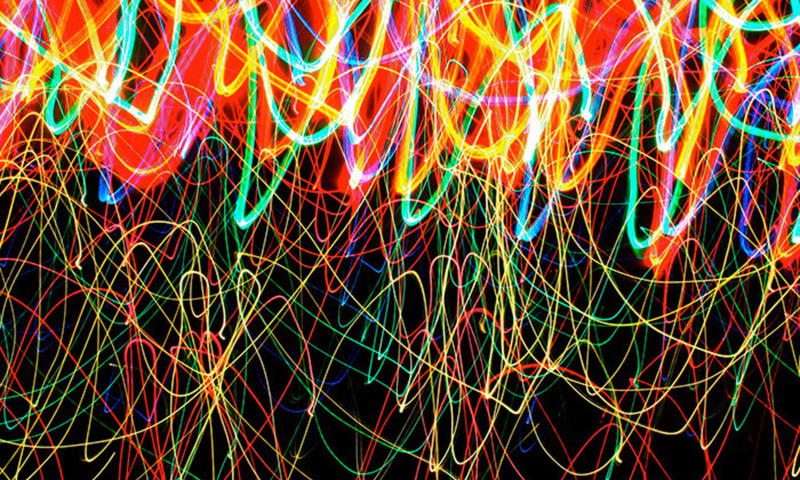 Previous experiments involving a technique called ‘entanglement swapping’ had already showed quantum correlations across time, by delaying the measurement of one of the coexisting entangled particles; but Eli Megidish and his collaborators were the first to show entanglement between photons whose lifespans did not overlap at all. Here’s how they did it. First, they created an entangled pair of photons, ‘1-2’ (step I in the diagram below). Soon after, they measured the polarisation of photon 1 (a property describing the direction of light’s oscillation) – thus ‘killing’ it (step II). Photon 2 was sent on a wild goose chase while a new entangled pair, ‘3-4’, was created (step III). Photon 3 was then measured along with the itinerant photon 2 in such a way that the entanglement relation was ‘swapped’ from the old pairs (‘1-2’ and ‘3-4’) onto the new ‘2-3’ combo (step IV). Some time later (step V), the polarisation of the lone survivor, photon 4, is measured, and the results are compared with those of the long-dead photon 1 (back at step II). Figure 1. 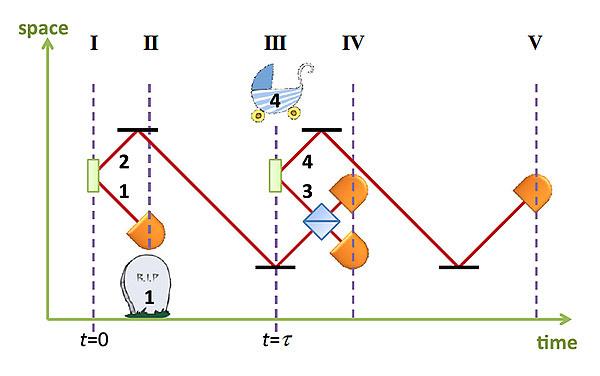 Time line diagram: (I) Birth of photons 1 and 2, (II) detection of photon 1, (III) birth of photons 3 and 4, (IV) Bell projection of photons 2 and 3, (V) detection of photon 4. The upshot? The data revealed the existence of quantum correlations between ‘temporally nonlocal’ photons 1 and 4. That is, entanglement can occur across two quantum systems that never coexisted. What on Earth can this mean? Prima facie, it seems as troubling as saying that the polarity of starlight in the far-distant past – say, greater than twice Earth’s lifetime – nevertheless influenced the polarity of starlight falling through your amateur telescope this winter. Even more bizarrely: maybe it implies that the measurements carried out by your eye upon starlight falling through your telescope this winter somehow dictated the polarity of photons more than 9 billion years old. Lest this scenario strike you as too outlandish, Megidish and his colleagues can’t resist speculating on possible and rather spooky interpretations of their results. Perhaps the measurement of photon 1’s polarisation at step II somehow steers the future polarisation of 4, or the measurement of photon 4’s polarisation at step V somehow rewrites the past polarisation state of photon 1. In both forward and backward directions, quantum correlations span the causal void between the death of one photon and the birth of the other. Just a spoonful of relativity helps the spookiness go down, though. In developing his theory of special relativity, Einstein deposed the concept of simultaneity from its Newtonian pedestal. As a consequence, simultaneity went from being an absolute property to being a relative one. There is no single timekeeper for the Universe; precisely when something is occurring depends on your precise location relative to what you are observing, known as your frame of reference. So the key to avoiding strange causal behaviour (steering the future or rewriting the past) in instances of temporal separation is to accept that calling events ‘simultaneous’ carries little metaphysical weight. It is only a frame-specific property, a choice among many alternative but equally viable ones – a matter of convention, or record-keeping. The lesson carries over directly to both spatial and temporal quantum nonlocality. Mysteries regarding entangled pairs of particles amount to disagreements about labelling, brought about by relativity. Einstein showed that no sequence of events can be metaphysically privileged – can be considered more real – than any other. Only by accepting this insight can one make headway on such quantum puzzles. The various frames of reference in the Hebrew University experiment (the lab’s frame, photon 1’s frame, photon 4’s frame, and so on) have their own ‘historians’, so to speak. While these historians will disagree about how things went down, not one of them can claim a corner on truth. A different sequence of events unfolds within each one, according to that spatiotemporal point of view. Clearly, then, any attempt at assigning frame-specific properties generally, or tying general properties to one particular frame, will cause disputes among the historians. But here’s the thing: while there might be legitimate disagreement about which properties should be assigned to which particles and when, there shouldn’t be disagreement about the very existence of these properties, particles, and events. These findings drive yet another wedge between our beloved classical intuitions and the empirical realities of quantum mechanics. As was true for Schrödinger and his contemporaries, scientific progress is going to involve investigating the limitations of certain metaphysical views. Schrödinger’s cat, half-alive and half-dead, was created to illustrate how the entanglement of systems leads to macroscopic phenomena that defy our usual understanding of the relations between objects and their properties: an organism such as a cat is either dead or alive. No middle ground there. Most contemporary philosophical accounts of the relationship between objects and their properties embrace entanglement solely from the perspective of spatial nonlocality. But there’s still significant work to be done on incorporating temporal nonlocality – not only in object-property discussions, but also in debates over material composition (such as the relation between a lump of clay and the statue it forms), and part-whole relations (such as how a hand relates to a limb, or a limb to a person). For example, the ‘puzzle’ of how parts fit with an overall whole presumes clear-cut spatial boundaries among underlying components, yet spatial nonlocality cautions against this view. Temporal nonlocality further complicates this picture: how does one describe an entity whose constituent parts are not even coexistent? Discerning the nature of entanglement might at times be an uncomfortable project. It’s not clear what substantive metaphysics might emerge from scrutiny of fascinating new research by the likes of Megidish and other physicists. In a letter to Einstein, Schrödinger notes wryly (and deploying an odd metaphor): ‘One has the feeling that it is precisely the most important statements of the new theory that can really be squeezed into these Spanish boots – but only with difficulty.’ We cannot afford to ignore spatial or temporal nonlocality in future metaphysics: whether or not the boots fit, we’ll have to wear ’em.